Demand for proppants in North America will grow 4.2% annually to 103 billion pounds in 2021. Proppants activity has shifted geographically, with Texas coming to account for one-third of all completions in North America in 2016. With both longer laterals and a near doubling of fracturing intensity in terms of pounds of proppant per lateral foot since 2014, increased proppant volumes have driven well advances. While Northern White sand will remain the most important type, the industry has displayed strong interest in developing new sources of sand. 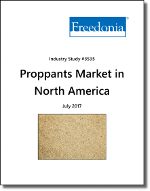 This Freedonia study analyzes the proppants market in North America. It presents historical data (2006, 2011, 2016) and forecasts (2021) by type (raw frac sand, resin coated sand, ceramic proppants) and location (Texas, Oklahoma, Ohio and Pennsylvania, Colorado, North Dakota, Louisiana, New Mexico, Alberta) in pounds and US dollars. The study also assesses key industry players in the proppants market, such as Unimin, US Silica, Fairmount Santrol, Hexion, Hi-Crush, Badger Mining, Saint-Gobain, Pattison Sand, Pioneer Natural, Preferred Sands, Premier Silica, Emerge Energy Services, EOG Resources, CARBO ceramics.